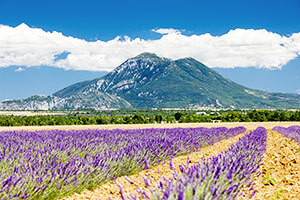 Provence begins in the southern French Alps, and in the département called Alpes de Haute Provence there is an enormous difference between the north and south. In a tormented, rocky landscape crossed by the Durance River, its life-giving backbone, the climate changes from mountain to Mediterranean. The diversity allows the region to grow a wide variety of plants whose virtues have been recognized and used since the dawn of time. So it was not by chance that the knowledge of medicinal herbs, known as simples, and their commercial trade became common among the region’s inhabitants, especially those who live in the villages at the foot of the majestic Montagne de Lure, near Forcalquier—an area particularly rich in the wild plants used in many folk remedies. Many of the locals became traveling herbalists, peddling their remedies throughout Europe. They left on their travels in the fall and returned in late spring to rest and replenish their supplies. Some set themselves up as druggists and, later, apothecaries. Very soon the principles of distillation became common knowledge among the region’s populace too, and shepherds started distilling mountain lavender in the summer to produce an essential oil, using alambics, or stills, borrowed from merchants in the cities. Thyme and rosemary were also widely distilled. The professions of itinerant herbalist, druggist and apothecary gradually evolved into that of pharmacist—they settled in large towns and concocted all sorts of remedies from the region’s native plants. At the same time, dozens of distilleries flourished, producing not only essential oils but also liqueurs. These were easier to transport than the plants themselves, and the reputation of these plant-based products, already impressive, continued to grow. Today, in the Alpes de Haute Provence, only one of these distilleries remains. Created in 1898, it has survived all the turbulence of the past century and continues, come what may, to perpetuate a savoir-faire that was the source of the region’s glory and wealth for centuries. The distillery has changed hands several times, but its most notable history began when Henri Bardouin took over the Distillerie de Lure in 1944, after one of its owners was killed by the Germans for taking part in the Resistance. Of course it was extremely difficult at that time to keep the distillery going—even after the war, rationing continued, and it wasn’t until 1950 that all the restrictions were lifted. It was still called the Distillerie de Lure then, named for the nearby mountain. In 1974 Henri handed the distillery down to his son Jacques who ran it with three friends, one of whom, Alain Robert, is the current CEO. Robert continues to produce aperitifs and liqueurs using traditional methods—his pastis, L’Occitanis, was particularly popular at that time. At one point the distillery was bought by Pernod Ricard, but in 1990 Robert bought it back. Now a small business with some thirty employees, it continues to make innovations in its varied products while at the same time guaranteeing traditional quality. 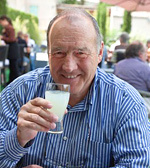 Following the buy-back by Robert, the company changed its name to the Distilleries et Domaines de Provence, and soon after that he created an even more upmarket pastis, christened Pastis Henri Bardouin in homage to his predecessor. Pastis Henri Bardouin wants to be considered an “anti-pastis”, a play on the Italian “antipasti”. Why this description? Because this pastis is the opposite of most of the others today. Tasting it, you discover a subtle palette of flavors and aromas in harmony. And while anise dominates, it’s not aggressive, and the overall taste is fresh and clear. The finesse of this drink would convert even the most recalcitrant drinker who might usually be anti-pastis. It’s meant to be served very diluted, with six to ten times its volume of pure, cold water. If ice is added, it should be done after the water, so that the pastis doesn’t crystallize on direct contact with the ice cube, spoiling the taste. All the liqueurs and spirits produced by Distilleries et Domaines de Provence are made by distilling and infusing the primary ingredients. The harvesting of wild herbs is, of course, done by hand, at times determined by each season’s flowering. As for thyme, all the company’s employees participate in its harvest, even those who are on vacation, so strong is the tradition. It’s a moment of joyful camaraderie that finishes with a barbecue on site once the herbs have been brought in. After being dried, the plants are macerated in a mixture of alcohol and water—the length of time depends on the plant. After the liquid is drawn off, the solid materials are pressed for more liquid and the two juices are mixed together. Part of that is distilled and then the ingredients are blended, a delicate operation, since the flavor is different with every batch, and the quantity of sugar and alcohol differ as well. Alain Robert’s second great idea was to start making real absinthe again. The early 20th-century rules were loosened when rigorous analyses showed that the active ingredients in absinthe were not as dangerous as they were long thought to be. That famous 1915 law banning the drink was passed mainly to fight against the alcoholism that had been rampant throughout the working class since the mid-18th century. And what is often overlooked is the fact that there was enormous pressure from wine producers to get it passed. But the real problem wasn’t absinthe itself or thujone—it was the poor quality of cheap alcohol at the time, and the large quantities consumed. Thujone can now be present again in liqueurs and spirits—at a very precise percentage: 35 mg per liter (.001 ounce per quart). It is therefore perfectly legal to drink traditional absinthe in France today—except that it can’t be called absinthe. The name can come close; it can even be called a drink with Artemisia absinthium. But it can’t officially be called absinthe. The company’s first absinthe was a 55% version called Absente, containing, besides Artemisia absinthium, other artemisias (or wormwoods, all the same family) and, to balance the bitterness, anise, mint and spices. The next creation was Grande Absente, at 69% with—besides the artemisias—anise and star anise, mint and melissa. Of course, neither is drunk straight; they’re served over ice, or with water poured over a sugar cube placed on a pierced absinthe spoon. Or they’re used as cocktail ingredients. The last in the series, Crème d’Absente, a liqueur at 18%, is served straight, over ice. All three have individual, pronounced characters and an array of unusual flavors. Besides pastis, and traditional liqueurs including those made from almonds and thyme, the distillery produces four wine-based aperitifs that are adding to its renown. In Rinquinquin, a white wine from the Luberon is flavored with peaches—both the fruit and the leaves are used. Its aroma of fresh white peaches enhances its flavor, and the scent of the crushed leaves is clearly discernable. It’s a lively drink, its slight bitterness balanced by sweetness, and makes a terrific aperitif that you don’t have to be thirsty to enjoy—sipped straight, on the rocks, or mixed with soda or tonic. Orange Colombo has a base of rosé wine, an enticing aroma of orange zest and a certain bitterness, combining sweetness and acidity like a tart lollipop. Noix de Saint Jean is made from crushed green walnuts that have been macerated in red wine with nutmeg and cinnamon. The aroma of walnuts predominates; the flavor is rich and powerful, recalling fortified wines like port or Banyuls. Finally, for those who enjoy very bitter drinks, Gentiane de Lure is made with fortified white wine, which balances the earthy and medicinal taste of the gentian; besides the bitterness, there are flavors and aromas of citrus fruit as well as an astringency almost like that of raw artichokes. It’s meant to be served with sparkling water or over crushed ice. It’s an acquired taste, but worth a try. Absinthe, made from Artemisia absinthium which is a variety of wormwood, was banned in 1915 because one of its components, thujone, was thought to be dangerous, and to possibly cause madness. The ban sent pastis sales soaring. Provençal families had long been accustomed to distilling their own pastis, adding anise and other herbs to alcohol or wine and letting the mixture macerate for several weeks—the word pastis simply means mélange in Provençal. This homemade pastis was traditionally served diluted with water as a thirst-quencher, and was always offered to visitors as a sign of welcome. With the increasing urbanization of the population, the tradition of home distilling largely disappeared, to be replaced by industrial pastis production. A 100-year-old essential oil still is used for extraction; its cauldron is heated with a wood fire, and 144 copper pipes carry the boiling water needed to obtain the vapor. The whole thing is housed in a barn from another era—when the still is in operation it’s a scene from the gates of the inferno. Jeannot, a colorful figure, is the master of ceremonies and a licensed private distiller. The day that this ancient monster of a machine gives up the ghost, a modern one that can distill with as much subtlety will have to be found, and a hard task that will surely be. Top: The 100 year-old still, working as hard as ever . . .
2nd down: Discharging the still after the distillation has been completed. 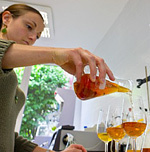 3rd down: Bérangère Perez blending in the distillery's modern laboratory. Above: Alain Robert enjoys a drink. No fewer than 29 ingredients go into its composition—many of them are local plants, such as fennel, artemisia, verbena, thyme, rosemary, oregano and many others. There are also Asian spices like cardamom, star anise and nutmeg along with African guinea-pepper, Middle Eastern licorice root, and South American tonka bean. In short, a delicious mixture that gives it a unique and elegant flavor.